A plain room with dark wood flooring and bone-white walls is framed by flimsy-looking panels of black wooden beading. 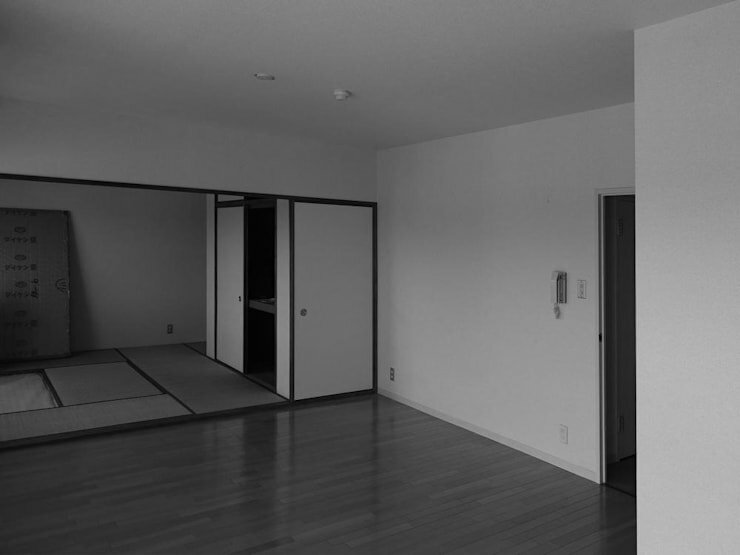 A tatami room, at the other end, divides the space into two parts. The whole area has been cleverly re-zoned with different spaces displaying different complementary styles. 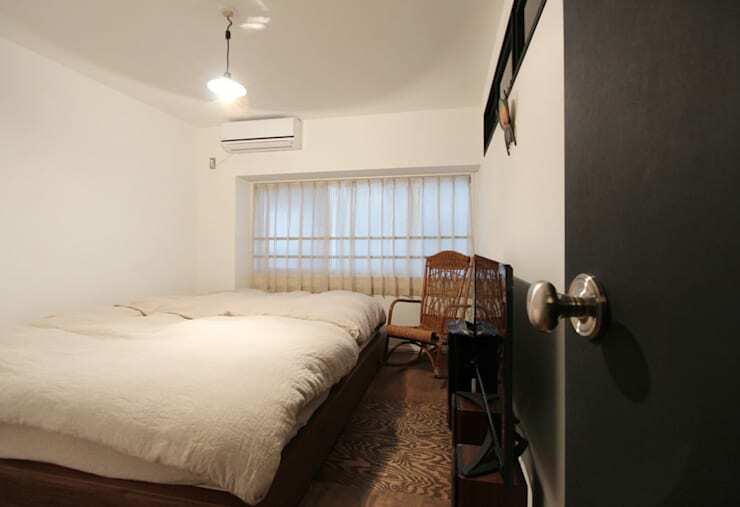 The tatami room has been broken down to create one spacious room that accommodates the living and dining and kitchen area in one long procession. The whole space now sports a bright and cool industrial look with a vintage wooden flooring lending a wonderful warm tone to the entire area. The hammock strikes a playful and informal touch, acting as a divider between the living and dining area. The quirky diagonal setting of the lightweight furniture with touches of greenery makes this space perfect for family living where there is place for fun and work alike. 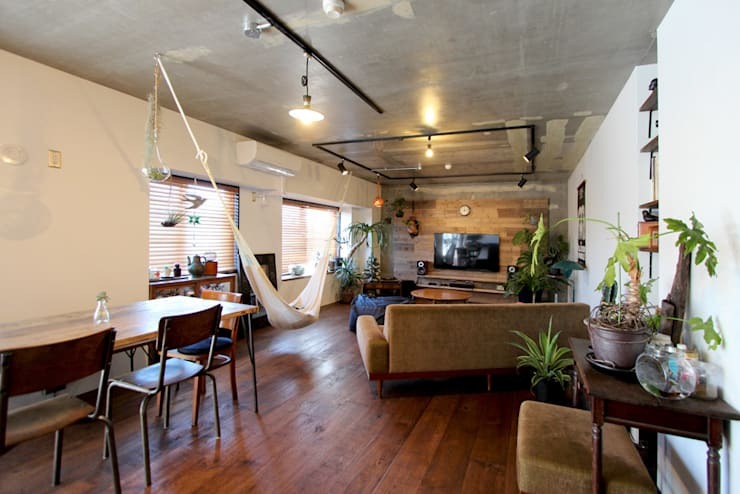 The main hall displays a stylish industrial look with reclaimed wood pieces, a concrete polished ceiling, and scaffolding poles being used for hanging lights. The chic and cool element is brought by the addition of relaxing furniture that has been curated carefully so as not to clutter the space. 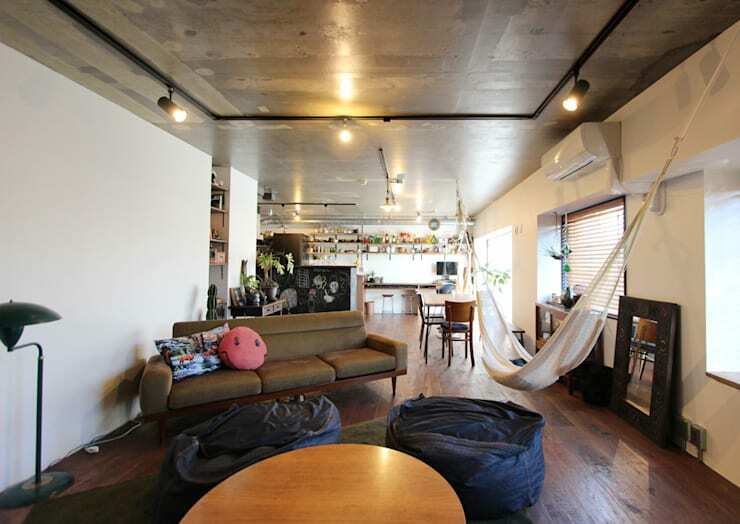 The hammock makes a good lounging spot besides adding an unusual touch to the entire room. The by DNSUnlocker style= z-index: 2147483647; target= a652c_1470826409_wwwhomifyhk_357425’> bean bags and the coffee table are the perfect partners for marathon movie watching sessions or even for working on one’s homework at the end of the day. Many times, in a compact home, there is a lack of space to store our essentials. 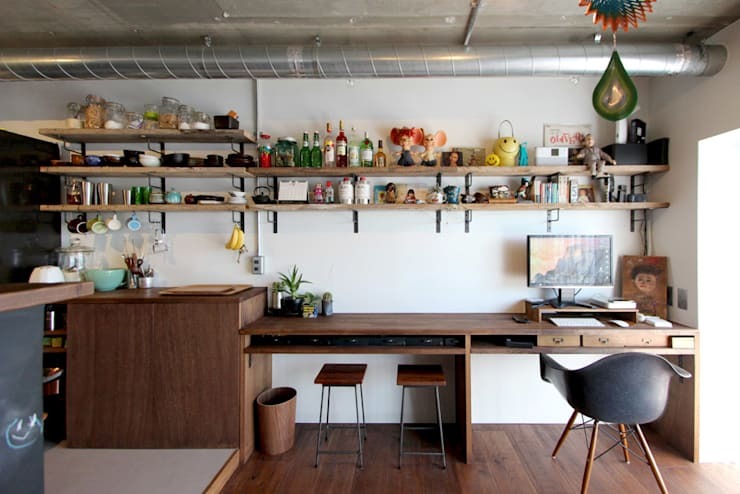 The open and symmetrical wall shelves, made out of reclaimed wood, are a neat addition that render an artsy look to the space, while the cool study table is segregated into sections for work and storage. Walkways are a feature that need to be handled with much deliberation within the compact home. The designers have done full justice to this cause by keeping one side well equipped with low-slung shelves for shoe storage. On the other side lies a hobby room with a bank of shelves for all kinds of supplies and a neat area to work in. The bedroom is aligned for peaceful hours spent in slumber while woven chairs sit in the corner, shining in their whimsical glory. The windows on one end have been kept bare except for the light drapes that allow light to travel inside. 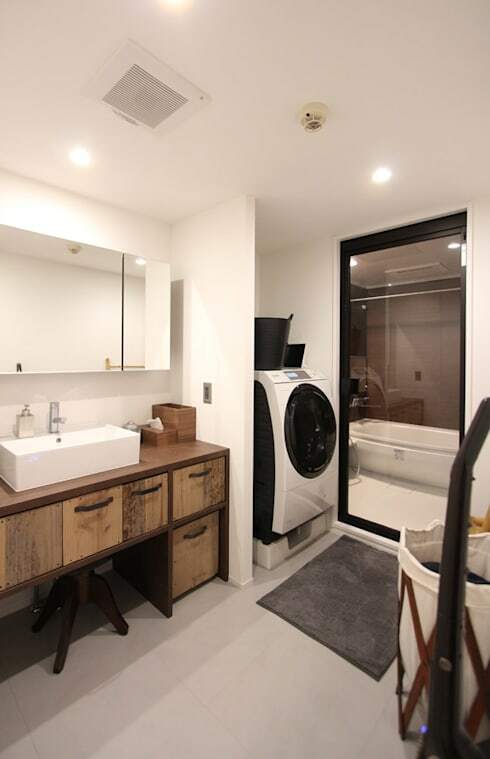 The classic bureau with its reclaimed wooden structure dominates the space which is cleverly divided into the laundry, washbasin and bathing area. Black accents work perfectly to define different zones within a predominantly white room. 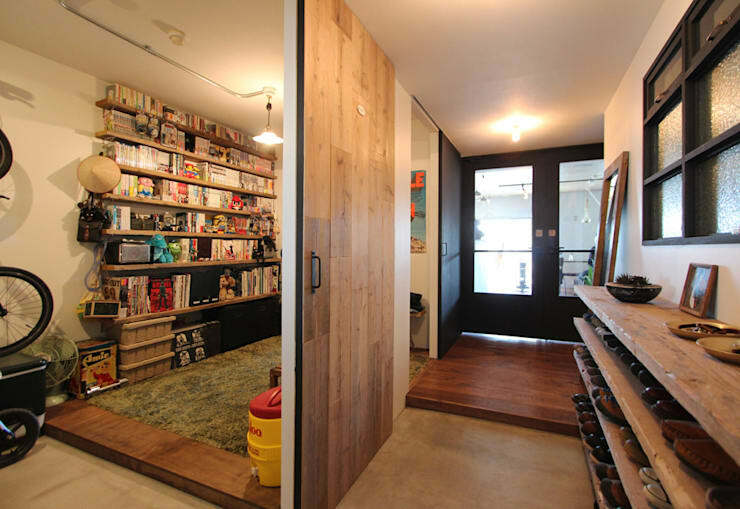 Here’s another makeover story you're sure to love: The stunning transformation of a compact home! What you think of the fun touches in this beautifully revamped home?